Rudy Sarzo has been a professional recording and performing artist worldwide for over 20 years. As a member of Ozzy Osbourne's band, from March 1981 to September 1982, Rudy toured the world in support of the "Blizzard of Ozz" and "Diary Of a Madman" records. His bass playing can be heard on Ozzy's multimillion selling CD "Tribute" and "Speak of the Devil" CD and DVD. As a member of Quiet Riot, from September 1982 to January 1985, Rudy recorded the multi-platinum albums "Metal Health", the first Heavy Metal debut to reach #1 on the Billboard charts and "Condition Critical". During this period Rudy headlined worldwide tours, appeared on numerous MTV videos and was voted #1 Bassist in Circus Magazine for 1983. As a member of Whitesnake, from April 1987 to September 1994, Rudy recorded the multi-platinum album "Slip of the Tongue". During this period Rudy also performed worldwide on headline tours in support of the multiplatinum "1987" and "Slip of the Tongue" albums and appeared on 6 MTV videos. As a member of the reunited Quiet Riot, from May 1997 to August 2003, Rudy performed worldwide on headlining tours and as special guests in support of the Quiet Riot CDs "Alive and Well" and "Guilty Pleasure. Rudy also appeared on VH1's Quiet Riot, Behind the Music. In November of 2003, "Quiet Riot Live in The 21st Century" DVD was released after the group disbanded. His recordings with all of these artists combined have sold over 30 million copies. 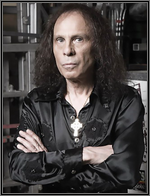 In February of 2004, Rudy joined Yngwie Malmsteen's Rising Force for the U.S. 30 city "Attack Tour" and in April 2004 became the newest member of Dio.